Whew! We made it to all the shops on our ‘passport’. We looked, we petted, we bought! As we had the ‘help’ of two youngsters, Miss Isabella, age 4, and Miss Gabriella, age almost 3, our efforts to touch every skein of yarn in all six shops was somewhat impaired. But, the two young ladies did a pretty good job of ‘helping’ and finally each got to pick a skein of yarn to ‘work’ on. There were six shops to visit. Two were completely unknown to me. First we visited Knitty Couture, a charming shop on the western edge of St. Louis City proper in an area called ‘The Loop’. This is a vibrant area, an artsy sort of place, hip-slickin’ cool. Fun area to explore. From there we traveled to Knitorious. I had visited this shop only once before and found it to be not particularly crochet-friendly. Today was different. Not only was the shop stuffed with great yarns, they had a good selection of crochet hooks and even a few shop displays in crochet, including a lovely spiral motif shawl. Glad I visited and got rid of my first impression. Another plus was the toy box which kept the two little girls happily occupied for our half hour or so there. Next, while the kiddies napped, we drove to the farthest destination, The Weaving Department, in north St. Louis County. I’m well familiar with this shop and it’s a favorite of mine although I seldom get there since I moved farther away from it in 2005. The shop is crochet and knit friendly despite having started as a shop for weavers and spinners. They are long on glitzy yarns and mixed fibers. You can even buy a few of the yarns by the yard which is nice if you want a small bit for trim. The staff here is always friendly and the shelves are always stuffed FULL of interesting yarns. From there, we headed across the Missouri River to the old town area of St. Charles to Knit and Caboodle. This is a fairly new shop which has moved to larger quarters since opening only a couple years ago. They are also open seven days a week, a feature that draws them quite a few extra customers. Located on the cobblestoned streets in the heart of St. Charles’ Main Street is a plus. There is a casino nearby to stash a husband or boyfriend who has no interest in crochet! Pick him up later and let him see how you spent his winnings, right? Also in the immediate vicinity is a trail head for the Katy Trail (for bikers and hikers) and the Trail Head Mill and Brewery. I told you he wouldn’t mind…. This shop is stuffed with a nice array of yarns including a complete wall of Cascade 220 Wool for felting in every imaginable solid color. 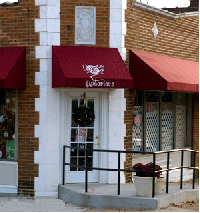 After Knit and Caboodle, we headed south to Hearthstone Knits, home of the St. Louis Crochet Club. They are especially well stocked with sock yarn which I wanted to match a coat I purchased for my mom to make a coordinating scarf. Found just the right blend of colors in a 100 g ball of Superwash ‘On Line’ sock yarn. Grabbed a piece of cake too, as I was starving. Finally, we traveled to Kirkwood Knittery, a shop that was new to me. I fell in love with this little shop. It has a huge amount of yarn stashed in a small but brightly lit space and very helpful staff. There was also a remarkable sale section where I scored 5 skeins of Reynolds Top Seed Cotton in Aubergine for $1 each! They had plenty of other colors too. I’ll definitely visit this store again, without the two ‘helpers’ so I can pay more attention to the scrumptious yarns. The girls and their adult companions (Ronnie and I) were running out of steam anyway. But, this is a definite must-visit-again shop. So, we turned in our Passports at the last shop visited and will wait, with thumbs firmly crossed, to see if we win any of the yarn or gift card giveaways when the drawings are held. Each of us also came away with a bag full of yarn. I was a bit more conservative than Ronnie – but she’s a much more prolific crocheter than I am. I found just the right white yarn for my daughter’s shawl, the sock yarn for my mom’s scarf, the Aubergine cotton with enough yardage to make a Southbay Shawlette, and a couple of other goodies. 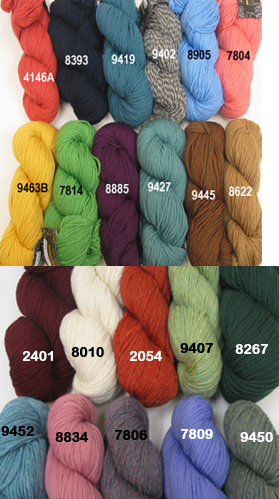 Ronnie scored some handpainted wool to make herself a sweater and assorted other batches of yarn. Every shop was busy, so I believe this Yarn Crawl was a success. There’s another day of the Crawl left – tomorrow afternoon when the shops (except for Knit and Caboodle) are usually closed. Can’t wait to hear who the winners of the drawings will be! Wish I was there! sounds like it was a blast! !